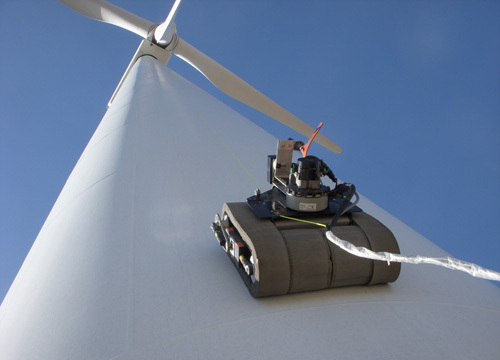 The clever people in General Electric have built a robot that climbs and inspects wind turbines! The full details are in Go Go Gadget: Robotic Crawler Rides Up 300-Foot Poles to Inspect Wind Turbine Blades, and I will include a photo here rather than trying to explain it! It looks really cool, and I am very impressed with its suction capabilities! There are many other interesting stories reported in GE Reports. Ireland hit a new wind-energy record on Thursday, 6 October at 2.30pm, when the power generated from wind reached 1,341 megawatts (MW) – enough power to supply 870,000 homes. Wind generation provided 39pc of the electricity being used in the Republic of Ireland at the time of the record on 6 October. I am very enthusiastic about wind energy, and I believe that it is likely to be the most sustainable source of energy in Ireland. Indeed, if I was starting my carer again I think that I would probably look at opportunities in that area. Anyway, I read an article recently about an Irish green energy company called Gaelectric teaming-up with a Chinese turbine manufacturer called XEMC. The article is Three new wind farms planned for Ireland, totalling 13.6MW.